due to construction at our shelton location. 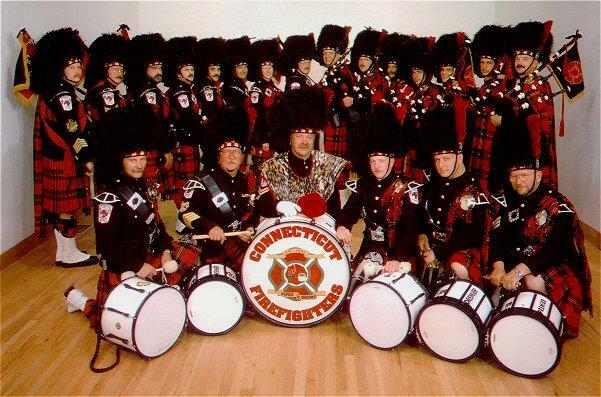 Band practice is held at the Echo Hose Firehouse located at 379 Coram Ave in Shelton, CT. on the 1st and 3rd Tuesdays of the month and at the Waterbury Firefighters Local 1339 hall located at 1551 Thomaston Ave in Waterbury, CT. on the 2nd and 4th Tuesdays of the month. Practice begins at 7:00 PM. The first hour of practice is usually dedicated to separate sessions for both the pipe and drum sections. The pipe section will review old music and practice new music using practice chanters at a table session lead by a pipe officer. Student pipers, if present will be given individual instruction. The drum section will work with Drum Instructor Ken Walker on both an individual and group basis. During the second half of practice, the pipe and drum sections will play together in a full ensemble performance.